by Oliver K. Luu in Asians Tags: $$$, anthropology, Asian parents, college, college majors, Confucius, doctor engineer or laywer take your pick, flipping burgers at McDonalds, GREAT SHAME AND DISHONOR, history, I am Asian coincidentally, reflection, rice, should I uphold tradition - but what is tradition? If you’ve been reading the news these days, you’ve probably come across one, or more, or many articles and op-eds telling people about how terrible it is for students to be going into the humanities or social sciences. 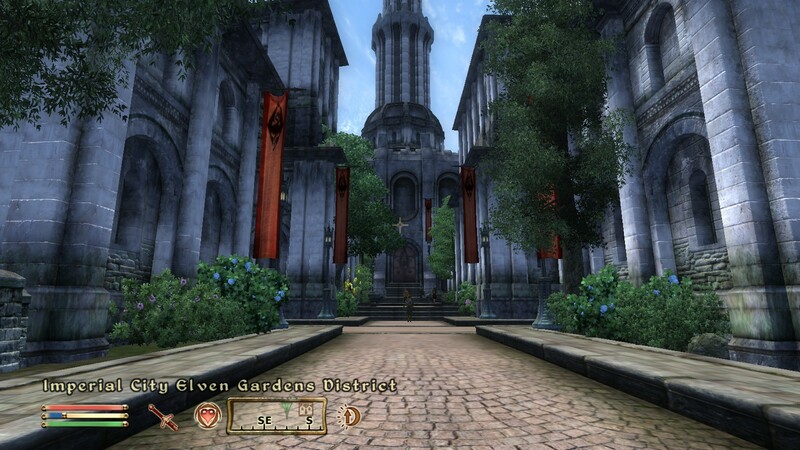 How will you find a job with that Studio Art degree? Will that Philosophy PhD satisfy your hunger? That B.A. in Anthropology will just land you a job flipping burgers at McDonalds! That looks delicious, except for the fact that I’m vegetarian. Actually, they are right. Slightly. Humanities, arts, social sciences, and so on: unfortunately, these majors tend to make less money than their science and mathy counterparts, and they also tend to have higher unemployment, even though, from what I’ve looked up, they still make more money and have better employment prospects than people without college degrees. So perhaps, as some of these articles and op-eds suggest, there are too many people going into the Humanities and Social Sciences. Fine. Makes enough sense. Society needs people going into all sorts of subjects, not just politics and literature. But see, for me, there’s a wee bit of a problem. 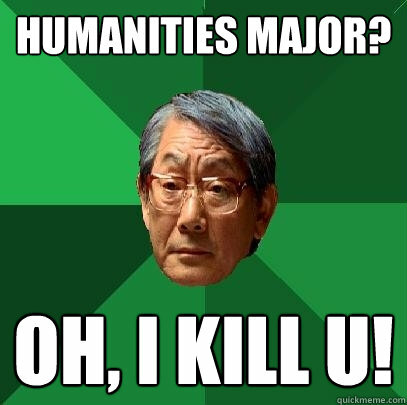 Asians, see, don’t tend to go into Humanities and the Social Sciences. Lots of Asians go into science, or engineering, or tech, or medicine, or something along those lines. I notice, for instance, a shift from “lots of Asians” to “not a lot of Asians” when I go from, say, my science/tech classes to my humanities/social science classes. That’s fine, really. I don’t have a problem with that. Actually, never mind, I do. Asians, along with other immigrant groups, tend to emphasize getting degrees in “useful” subjects much more than other non-immigrant groups. That’s perfectly justifiable, except so many Asians go into these “practical” fields that it’s become a problem of imbalance: some within the Asian and immigrant communities are starting to advocate for parents and other Asians to encourage their kids to go into fields other than the stereotypical doctor/engineer lineup. What does this have to do with Humanities and Social Sciences enrollment in general? It means that when I see the people saying that less and less people should be going into humanities and social sciences, I feel a bit conflicted. See, that might be true to some degree, but I’m also Asian. And as for us Asians, I believe the opposite should be happening – that more and more Asians should be going into the humanities and social sciences. Frankly, I don’t enjoy hearing an older Asian man or woman saying that I should just become a doctor, and I don’t want to hear another of that from somewhere else. I’ve heard it enough times, and I can just tell when they are about to say it. I don’t want to be another Asian doctor or engineer. I don’t need to. Some Asians are fine with those fields, and I respect that, but that is not for me. It’s an odd conflict. In general, there are more people in the humanities and social sciences than there should be; yet within the Asian (and immigrant) communities, it’s the opposite, in my opinion. Confucius, an Asian philosopher. I heard he was totally into the Humanities or something. But I do know it’s a good idea to not do something if you’re that ambivalent towards it. On the other hand, I also know it’s a good idea to plan ahead. There’s nothing wrong being an Art/Philosophy/whatever major, so long as you know the risks and consequences, and plan accordingly. I think that’s what we should be telling stupid kids like me, instead of “Take this major,” or “Don’t go into that subject.” I should be telling myself “Think about why you want to do this, the pros and cons, and how you are going to manage yourself with these tools.” After all, majors are nothing but tools. College degrees are nothing but tools. Some tools are better than others, certainly, but all tools are useful somehow. You just have to familiarize yourself with the tool, its purpose, its limits and its potential. That said, being a doctor ain’t fun. I’ve heard (though I cannot verify) that the debt from medical school makes other college debts look like a joke. Though I guess you can be a surgeon and get good pay to pay off your debts. Then again, it’s pretty stressful being one, I’ve heard. Because Florida Republicans have converted to that mindset. Or at least Florida governor Rick Scott did. The backlash from Anthropologists, particularly those in Florida, was intense, and justifiably so. The governor, so it seems, holds an erroneous, stereotypical idea of Anthropology that most of us also hold: that Anthropology is a subject concerned with only studying isolated tribes in the middle of some jungle. Most of us who have had exposure to Anthropology know better. Anthropologists have found employment in various places – including international corporations, the government, ICT companies, the military, and so forth – where their knowledge of culture and society are needed. Surprising as it is to some, Anthropologists study people – regardless of whether they are from the Bagwere tribe of Uganda, downtown Chicago, business settings in New York, or an Iraqi village near a US army base. The field is far from useless, especially with the advent of so-called globalization. But I won’t really rant too much about that here; if you want to read more, go search google (although two articles (here and here) are good places to start). Or, heck, just talk to an actual anthropologist. Governor Scott’s sentiments are nothing new for us Asians. Stereotypically, Asian parents have always had distaste for the Humanities and Social Sciences. However, I find it a dangerous mindset. The only degree that can guarantee you a job is either a medical or engineering degree, right? I admit it’s probably true. Statistically, apparently, those who major in STEM or economics/finance/business tend to have higher starting salaries and are blessed with better job demand. Fair enough. But here is what I think is a problem. Not everyone can or should get STEM. Imagine the problems that would happen if 90% of graduates got STEM degrees. Or, heck, even if 50% of graduates got STEM degrees, that still poses a big problem. I simply don’t think employers are looking for that many people. Alright, I admit I don’t have the statistics for this, but I think my point still stands. It is impossible to have so many jobs available for just a select amount of sectors. And furthermore, there is a need for people in the Humanities and Social Sciences. Because those majors teach you to analyze and study people, their behavior, and their attitudes. And that’s important, frankly, because, cliché as it sounds, humans are social animals. Some types of jobs and careers simply demand people who might not necessarily know as much about STEM subjects. As an example: who would you trust in dealing with intense international negotiations – an Engineering major or a Political Science major? Honestly I’d trust neither, but I’ll be more willing to place my bets that a PoliSci major has more knowledge about how to conduct international relations.